Simon Says Stamp and Show: Introducing the new members of the stamp & show team! 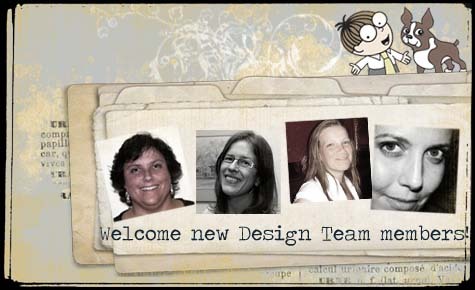 Introducing the new members of the stamp & show team! Greetings! First of all, let me just say that I was absolutely astounded and blown away by the talent, passion, and creativity of the Simon Says Stamp & Show readers who applied for our design team. You made narrowing it down very difficult and I wish we could invite each and every one of you to join the team! Now the good news is, everyone can always join in the challenge fun by entering and sharing their work – so I’m really looking forward to seeing all that you create and getting to know this wonderful community more. Who am I? I’ll introduce myself in a moment but first the announcement you really want to know about. After many long hours pouring over the entries, visiting and re-visiting blogs, and considering all of the various factors that go into choosing design team members we are excited to announce that four talented crafters will be joining our team! Suzanne Czosek is a crafter living in the Midwest (USA) that balances a busy home life with a love of paper crafting. I love her attention to detail and use of texture in her work, not to mention what a wide range of looks that she creates from very aged and vintage to downright adorable. Next up, Anna-Karin Evaldsson joins us from South Africa, where you can find her inking up a storm. Her layered stamping and her wide range of projects will have you inspired to break out more ink, that’s for sure. I look forward to reading about her creative process, as well as seeing what she dreams up next. Perhaps you wonder if first time applicants who have no previous design team experience ever get picked – absolutely! This is the case with Sandra Mouwen who joins us from the Netherlands. She creates cards, tags, and so much more. I find myself re-visiting her blog often and looking at her fantastic projects over and over again. Across the Atlantic Ocean in the southern United States you’ll find our fourth new team member Ashli Oliver. She has an amazing way of sharing her ideas, posts incredible project process photos on her blog that let you into her creative mind, and is totally fearless about getting ink, paint, and generally making a mess. I think you’re really going to be inspired by each of them in different ways, both with the projects they share here and the detailed looks at their projects and creative process on their personal blogs. Please join me in welcoming them all! Now that I’ve introduced them, I’ll take a minute and introduce myself! My name is May Flaum, and I’ll be leading up the team as well as dreaming up the challenges and doing all the behind the scenes stuff here at Simon Says Stamp & Show now. I love all things vintage, I can never have too many buttons or trims, and I do enjoy a good book. I’ve worked a lot of jobs in the craft industry over the last decade – currently you can find me teaching classes on-line, doing freelance design work, and almost daily you can find me at www.mayflaum.com. In fact this summer I’m hosting a prize and idea filled (FREE) blog event called “Camp Scrap” that is going on now! I am really looking forward to seeing your amazing creations, sharing new challenges and ideas with you, and to be working with such an amazing team. I will be making my project debut this week, and you can watch for our new members to begin joining in challenges in the near future as well. YAY! So thrilled to be a part of this amazing team! Thanks so much May! Excited to be joining this wonderful team! Whoo hoo a fellow South African on this team...Go Anna-Karin! Can't wait to see you what all dream up to inspire us. I am so happy to be on this fabulous team and I can't wait to get started with all the fun challenges! I'm so very happy to be in this amazing design team! Can't wait to get started! Congratulations to all the new DT members! WooHoo, Sandra! WTG, GF! Congrats to all the new design team members!! Congratulations ladies and welcome on board one of the greatest DT. I look so forward to see a lot of your amazing and inspiring work in the future. Have lots of fun and just enjoy the journey. What a bevy of talent here!!! Congratulations everyone!!! So excited for everyone. Their talent is amazing! Very Talented artists and I am eager to see all the wonderful creations. Congrats for all of you! !Especially to my BFF Sandra, HOORAY your in GIRL and you ROCK!!! I am so proud of you!!! Huge congrats girls can't wait to see what your future creations are going to be. Wow...how great to see a South African girl representing us on the DT!!! Many congrats Anna-Karin Evaldsson, enjoy your place on the DT!!! Congrats to the new DT, I'm looking forward to seeing their creations. Congrats to you all! I am sooo envious and HAPPY for you! Congrats to all the new team members!